Screenflex features a range of core screen and room-divider products, perfect for a variety of uses, backed up with a broad range of accessories. Standard/multi purpose divider is our best selling unit. Our best-selling divider provides the flexibility to divide rooms, display material, and absorb sound. With tackable panels and exceptional stability, the Standard divider is the solution for most customer needs. The room dividers arrive fully assembled and nest together for compact storage. Divide rooms and add structure to any given space with the WALLmount divider. This room divider attaches to a wall at one end and opens into the room with ease. The panels fold flat against the wall when stored. Perfect for industrial and commercial use, these dividers provide durability and functionality in hospitality, airport, arena and other rigorous environments. Extra features and more robust construction ensure flawless operation. Create collaborative workspaces with the perfect combination of writable surface and tackable fabric panels. 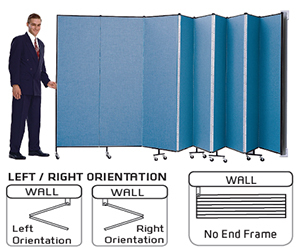 Ideal for use as an instructional aide, room divider, or display board. Have white board on one side and fabric panels on the back. This double sided fabric partition is an ideal office partition or portable divider for creating private spaces quickly and easily. Screenflex quality and versatility in a light weight room divider. This cost effective solution is ideal for home or light duty scenarios. The portable room divider glides effortlessly into position on ball-bearing casters making it easy to store. This movable clear acrylic divider provides division with vision. The acrylic see-through panels are wet erase compatible. Use the optional Multi-Unit Connector to secure clear or fabric dividers together to create a longer wall. Floor to ceiling suspended display system for posters, leaflets, brochures and banners. Create your own double sided partition in a modern attractive way. These acoustic panels are designed to reduce noise at the same time as dividing and making a space look attractive.